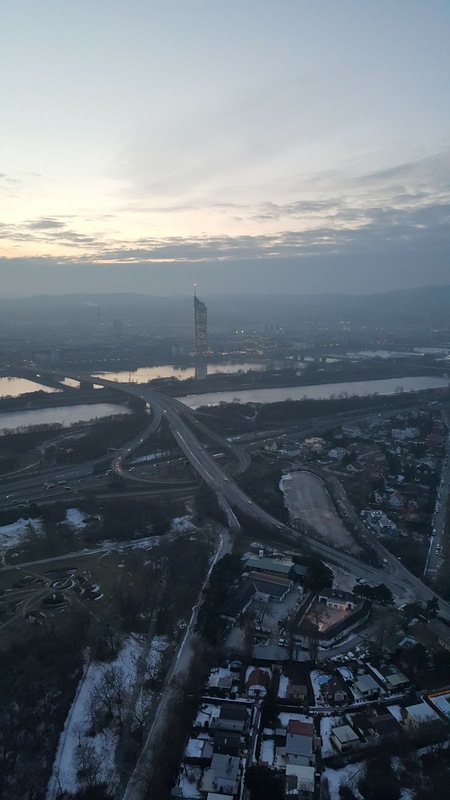 Built in the 1960's the Donauturm tower in Vienna is a must see on any visit to the Austrian Capital. 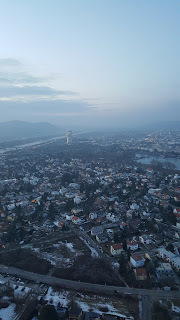 We decided to visit the tower in the afternoon as the sun was going down so that we could see the view in two different lights. 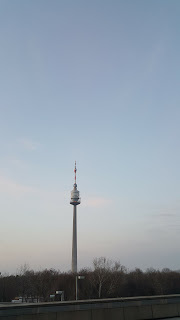 We got the tube train across the city to the business district of the city and started to follow the signs to the tower. 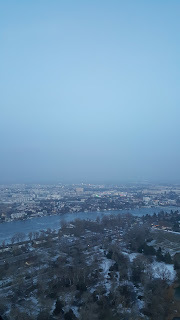 We could see the tower in the distance and it looked really quite far away. 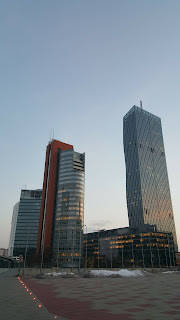 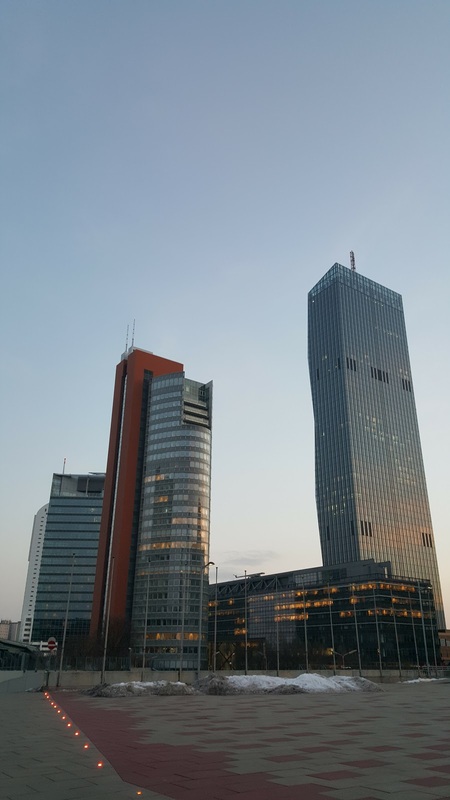 As we walked we passed through what felt like the business side of the city with modern high rise buildings and lots of modern architecture compared to the traditional Viennese architecture in the city. Walking to the Donautrum Tower though the modern buildings in the Donaustadt area of Vienna. 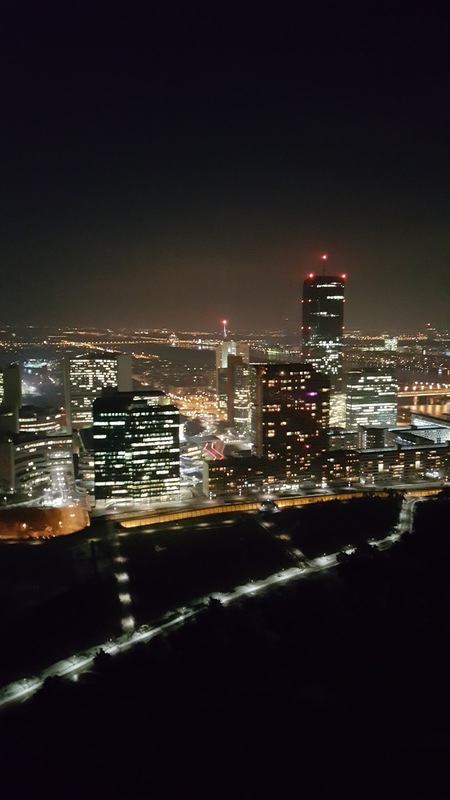 The pathway is lit up to the Donautrum tower that you can see in the distance. 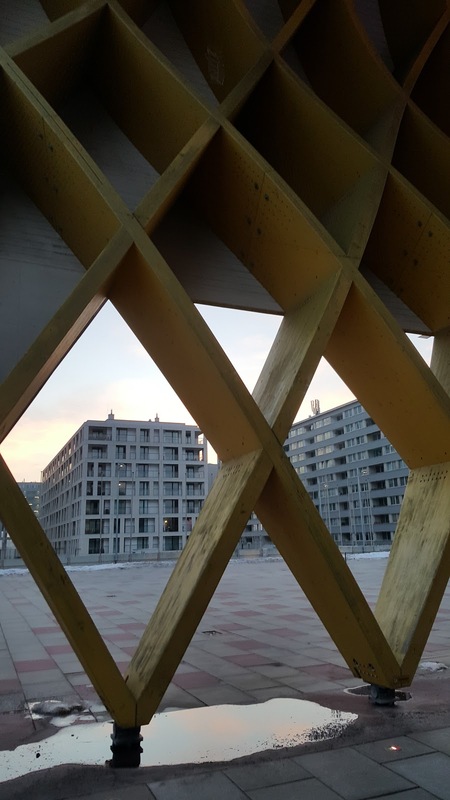 As we moved away from the office blocks we started to pass residential flats and were soon into the entrance of the Donaupark a large grassy park filled with lots of dog walkers and untrodden snow. 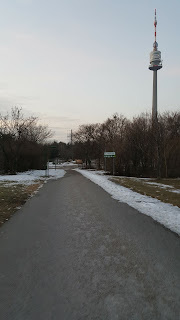 As we entered the park away from the shelter of the buildings the wind whistled through us and it was freezing! We hurried across the park and reached the entrance to the tower. 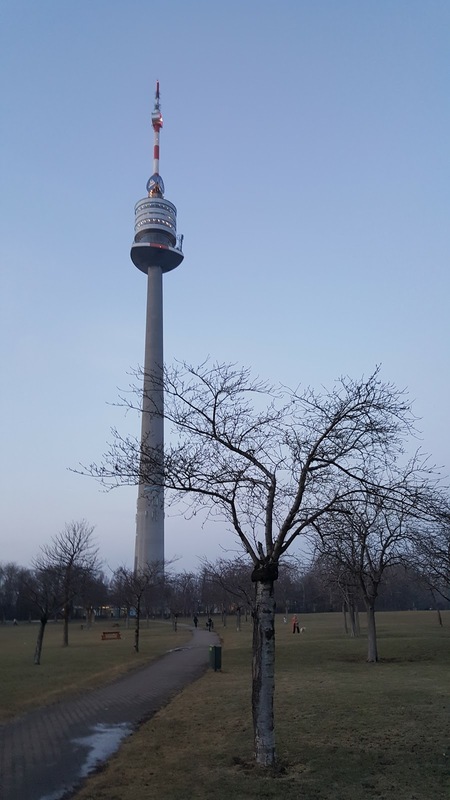 The tower is 252 metres tall in total or 827ft! It took 18 months to build and officially opened in 1964. 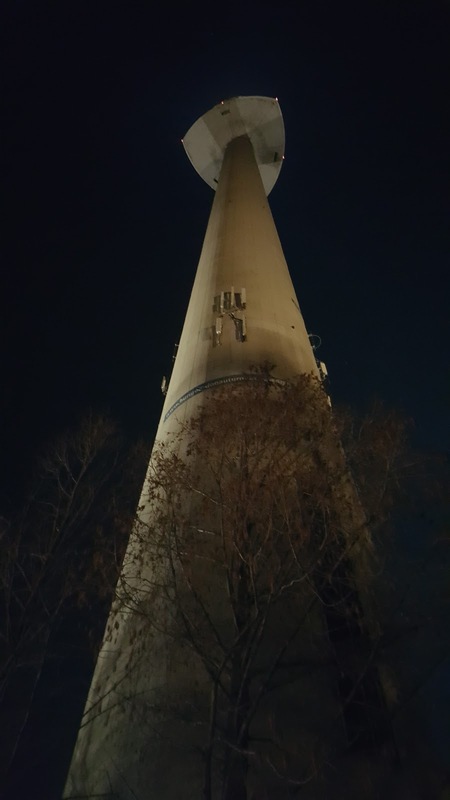 There are two lifts that run through the center of the concrete tower with a glass ceiling that lights up the tower as the lift rises so that you can see how far up you are travelling. 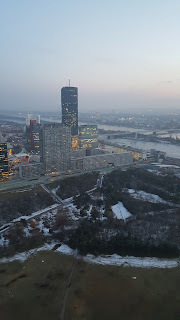 We went through the entrance and utilised our Vienna pass to gain access and were shown straight through to the lift. 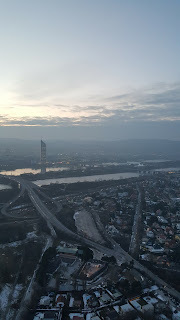 The lift was manned by an attendant and we were soon whizzing up the concrete tower to a viewing platform positioned150 meters high. 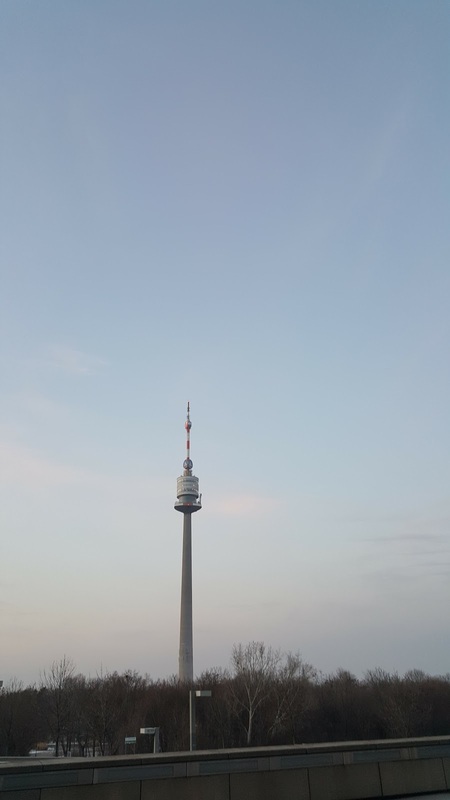 We headed straight outside to the external viewing platform before the sun set and it was incredible. 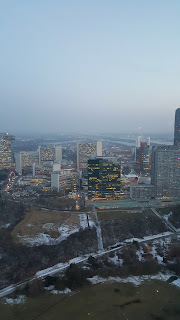 The view from the top was spectacular but it was bitterly cold. 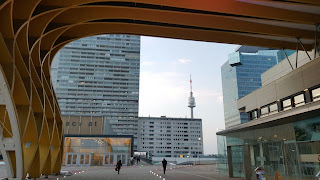 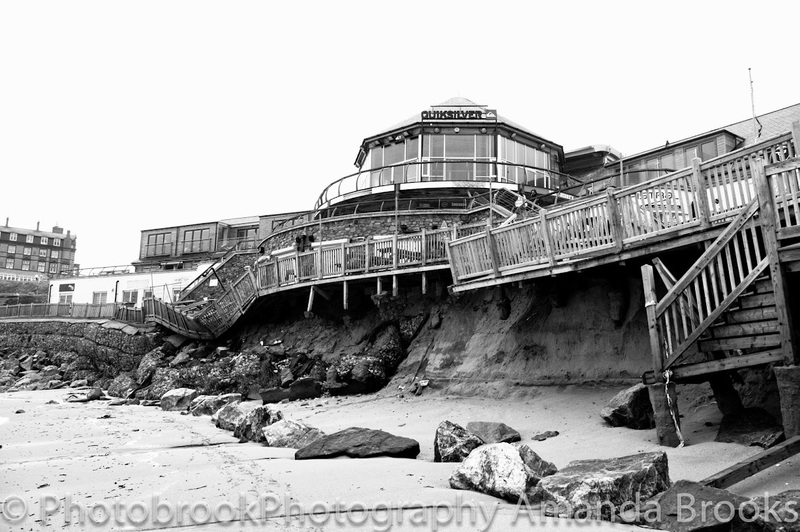 We hurried around the viewing platform before heading inside. 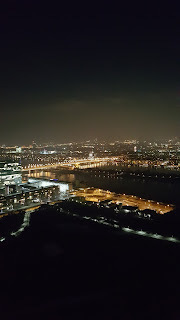 It is hard not to compare the experience with the experience of the View at the Shard in London. 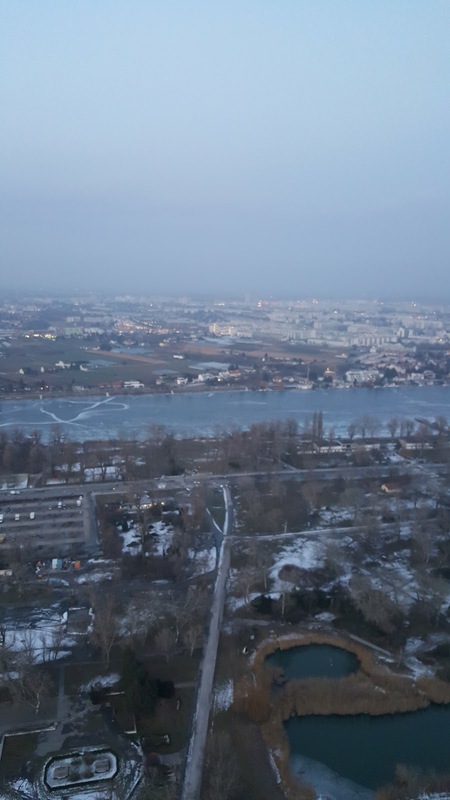 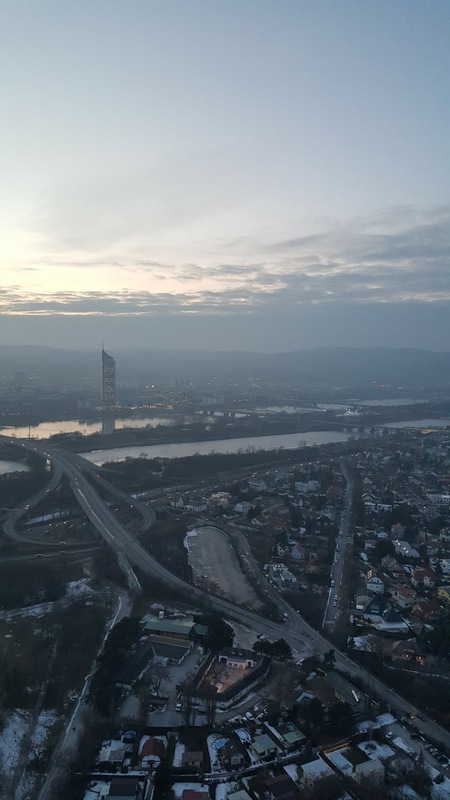 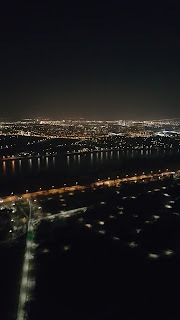 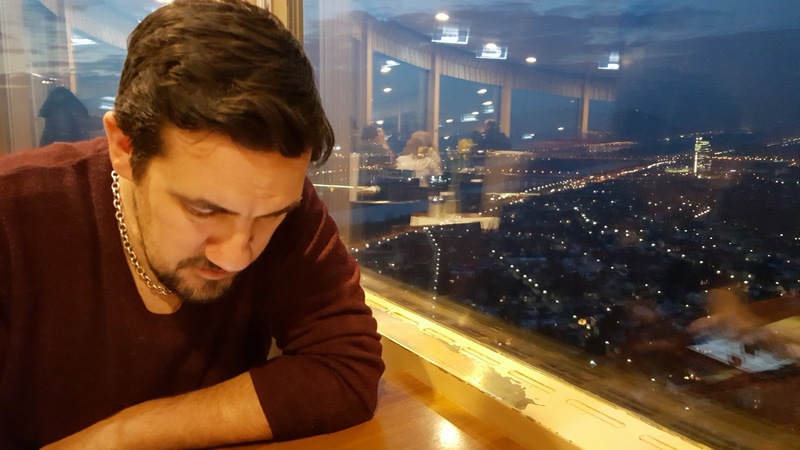 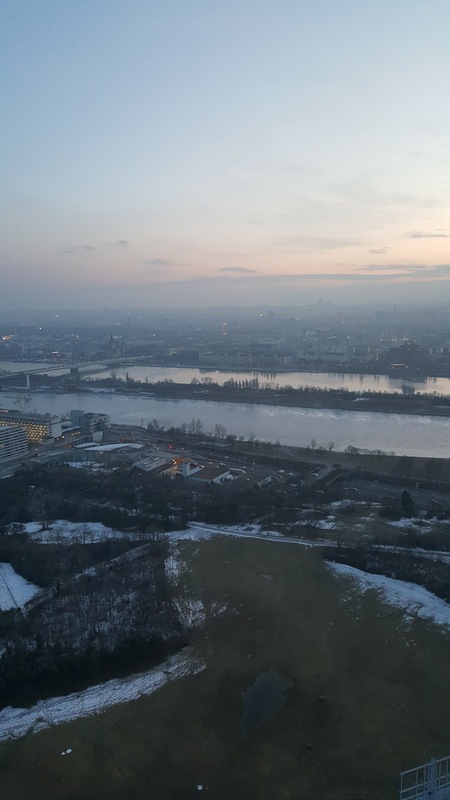 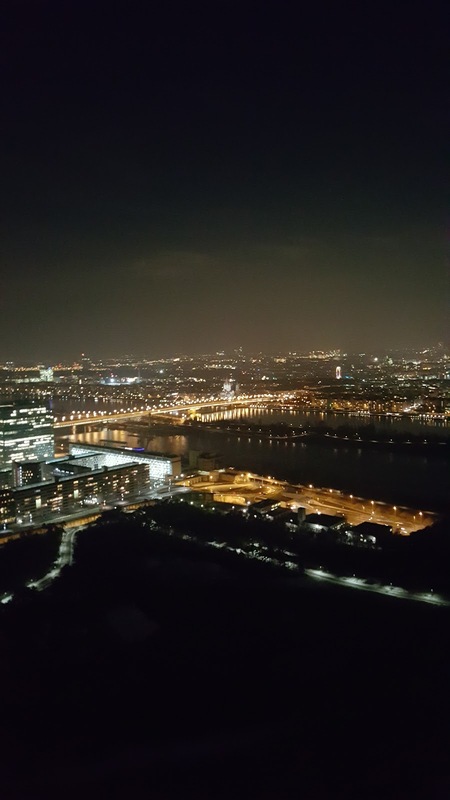 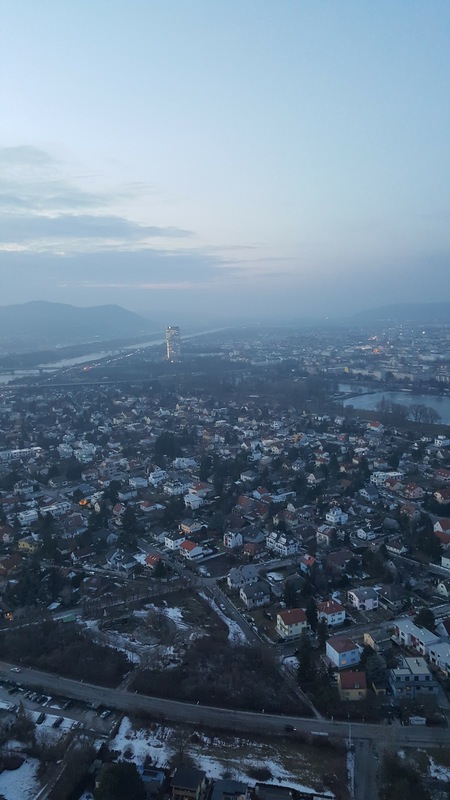 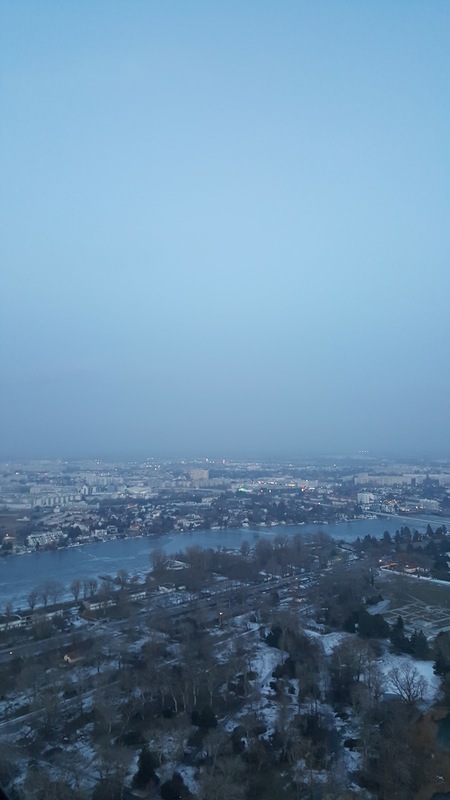 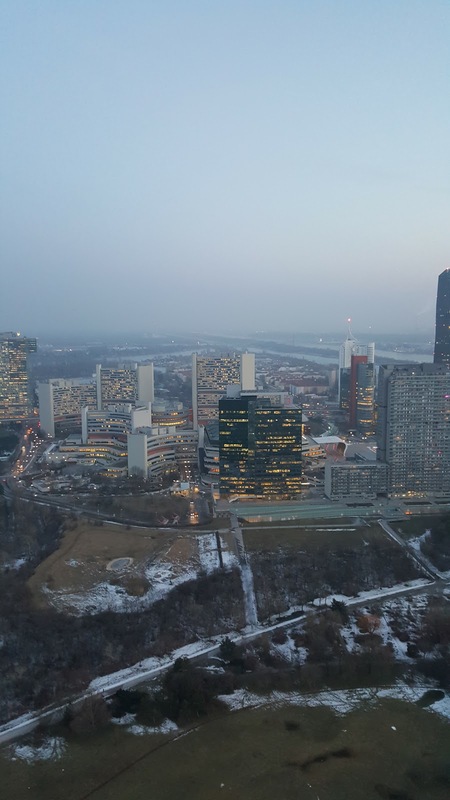 The Shard is a brand new building with modern lifts, modern viewing platforms and the Donauturn tower is a concrete dated tower that is nearly 80 years old but the views across Vienna were totally worth it. 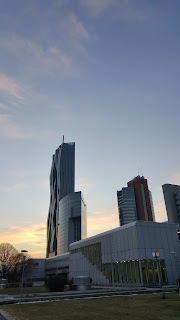 At the top of the tower are two rotating restaurants one described as a cafe and the one above this that is more of a restaurant. 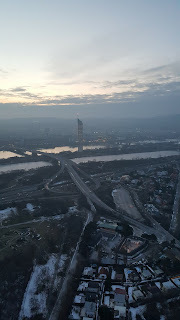 The problem with being a tourist is that you do want to experience every element of something and as a rotating restaurant virgin I wanted to stop for a visit. 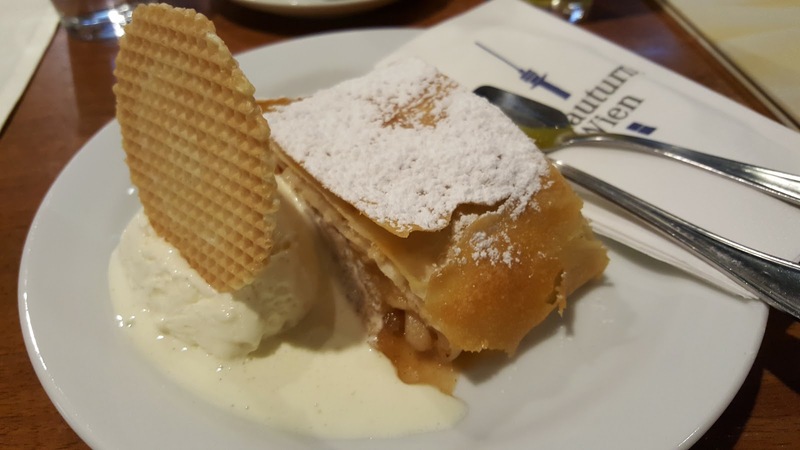 As we weren't actually hungry we decided that we wouldn't visit the restaurant but instead visit the cafe and decided on some hot drinks and some traditional Viennese strudel and vanilla creme. 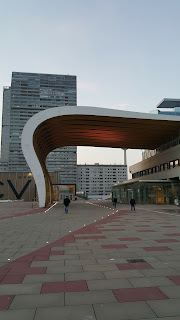 At first it felt odd stepping into the rotating restaurant. 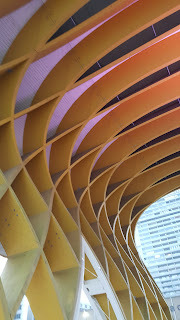 We worked out that the central cafe area was fixed and we were moving around this. We got a table and waiting for the cafe counter and all the cakes to come into view before a waitress came to take our order. 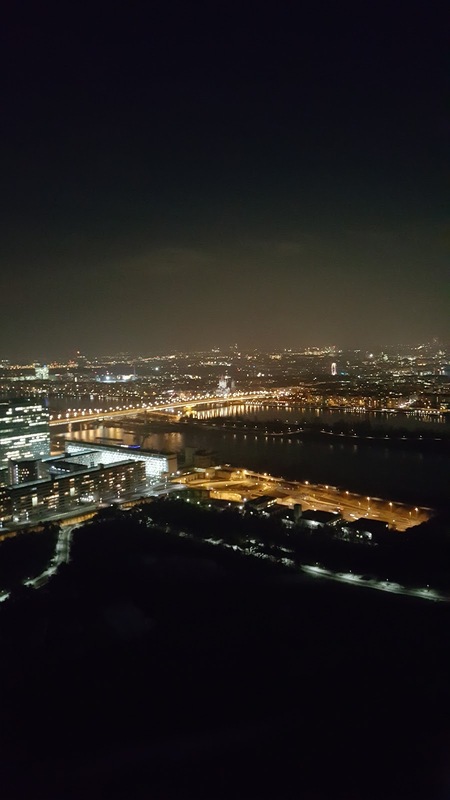 As the sun began to set we were able to watch the night sky of Vienna come to life. It was truly a new experience for me and I totally loved it however after a few rotations we did start to feel slightly odd and so made our way back down to the lift and back out into the cold. 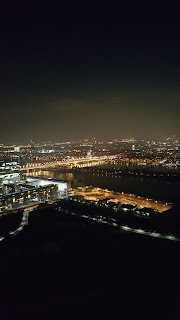 It was slightly strange being in a park in Vienna in the dark but it felt strangely safe and so we made our way back to the tube station and headed back into the busy city. Come back to my blog soon to read more about my awesome trip to Vienna.